Come up with the general walkthrough of what you’re trying to show. Don’t worry too much about what you’re going to say yet. Run through it once or twice for practice. Start recording. I don’t use the audio from this recording so just mumble along with what you’re doing. If you screw up don’t worry, just keep recording and go back to an earlier point to start again. Between each procedure it helps if you place the mouse in an open position and pause for a few seconds – this will give you an edit point without the mouse wandering around. Keep all your mouse movements very calculated. Edit the video: determine which parts of the video you’re going to use. Before chopping anything up, write your script in a text editor and keep it open next to the video (it’s helpful if you have dual monitors). Practice each part on the video, then edit the video to remove all the extra junk. Try to leave a little extra space so you have wiggle room for the voice narration. 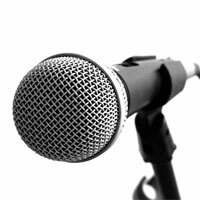 Start recording your voice narration. I do this in small snippets: save each part in a file (1.wav, 2.wav) then add it to the audio track and align it with the video. If I decide to re-record a part, I name it 1b.wav because Camtasia doesn’t like it when you try to re-import the same filename . After the whole thing is working I export the audio as a single wav, then tweak it using Audacity (as described in a NewsForge article), then bring it back into Camtasia. The only disadvantage to this technique is that the screencast might appear too “scripted” and not spontaneous enough, but for what I’m doing I was okay with that. This entry was posted on Thursday, April 20th, 2006 at 12:32 pm	and is filed under howto, screencast. You can follow any responses to this entry through the RSS 2.0 feed. You can leave a response, or trackback from your own site. Hi Patrick – This is awesome! All great advice. And, I like your ‘Edit the Video’ section. I’m going to try your advice for the script on dual monitors. Thanks for sharing the tips! I appreciate it…email me. One thing I forgot to note: I’m using an older version (2.1) of Camtasia Studio, but most of these tips should also be valid for newer versions. Pat, great tips! I’ve had this entry bookmarked for a long time and finally used your tips for my latest screencast. I still have some learning to do with Audacity and volume levels, but I think I’m getting the hang of it.